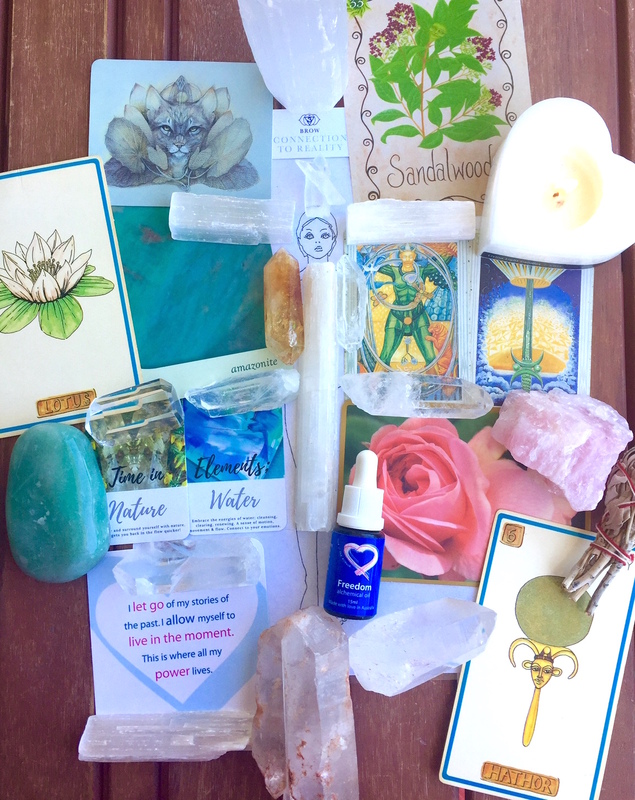 Ordering a Sacred Self Session is a beautiful way to support a specific intention in your life, commemorate a new dawning or chapter in your life. Or you may like to celebrate a high-holy occasion, such as your new business or a liberating divorce! Maybe you are ready to step into the greatest version of yourself and need some encouragement and support? Your Sacred Self Session is a magical sacred ceremony. I set an intention to connect with your higher self and ask what is most beneficial for you to receive at this time – for your highest potential. This incorporates your intention for the session. I connect to your energy field and see what it has to communicate and what is most needing loving attention at this time. All souls are eternally connected in oneness and geographic distance is an illusion, so it makes no difference wherever we are in the world. I will create an energy mandala personalised to you with crystals, self-love cards, oracle and tarot cards and an Alchemical oil – specifically related to the guidance that comes through for you. This will be superimposed over a simple diagram of the physical body. There will be sacred music played, chanted blessings, colour, light and sacred symbols included. I work very much with merging the sacred heart and sacred womb energy, to bring about transformation in a deeply feminine space – to bring long hidden gifts into the light. This is strongly influencing all that I am focussing on at present. 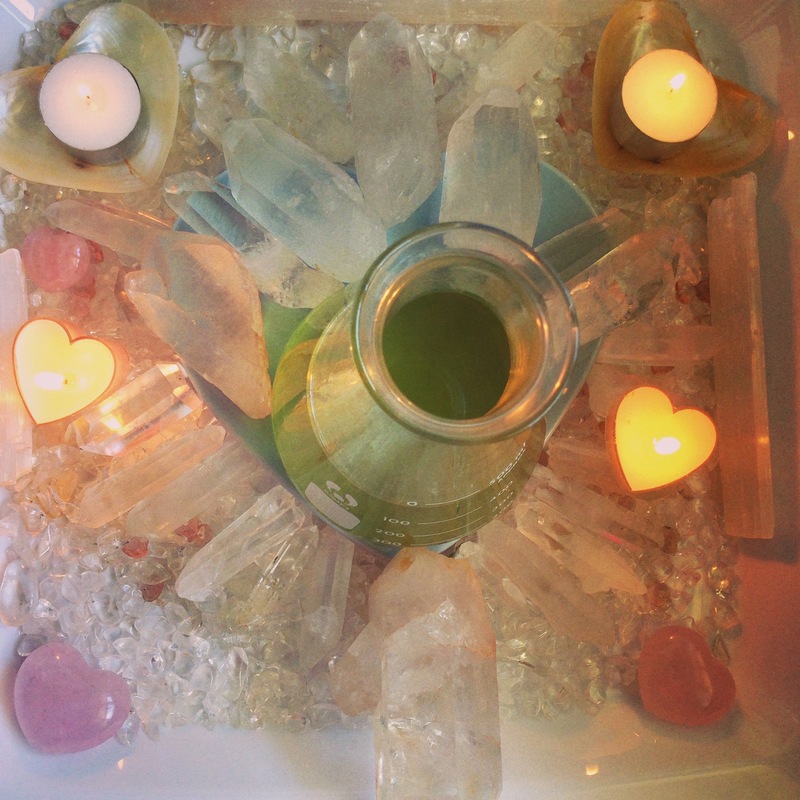 Your Energy Mandala will be charged with love in its very own crystal grid for a few days and the energy will be transmitted to you via Distant Healing. In order to receive maximum affect, I highly recommend that you set aside 1 hour to sit down, relax and listen to the audio and receive the energy. An audio file of intuitive guidance and energetic reading information with recommended practices. Each one is specific to the person and so varies. However, this could include information about specific chakras, or parts of the body that are receiving loving attention, insights and particular practices that are supportive as you integrate the changes. Often I also receive a certain piece of music/mantra therapy that encourages and supports the energy transformation. Sound frequency is one of the most powerful ways of transforming our energy. There could be essences suggested (you can invoke the pure consciousness of them into your Being energetically if you are not able to access). Suggested Alchemical oil that is most appropriate to support you as you integrate the energy and a limited time special, should you wish to purchase at a reduced price. I can’t wait to create something exquisitely unique and gorgeous – like you – just for you! Ready to order? I thought you’d never ask! Is there a particular intention that you’re focusing on right now? (Like: a new beginning, preparing for a new relationship, starting a business, a special birthday or just because you deserve some TLC). Please note: a phrase or sentence is sufficient. I say this with love – I do NOT need your life story and find this counter-productive as it engages the ‘story’ and the aim is to go beyond that. Our minds are limited in their understanding. The more you over-identify with the story, the more power you give it. Let’s focus on what you want to create and put all your energy into that instead. I choose to focus on your ultimate wholeness. Much more empowering. A recent full-length photo (within the last 2 months would be helpful – but not essential).